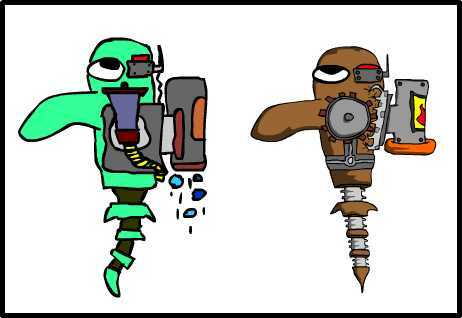 When we first started working on Robofish our plan was to implement 10 unique weapons each with 10 levels of power that you had to upgrade as you progress through the game. We completed all 10 weapons and their upgraded abilities before we realized that this just really wasn’t unique or innovative at all. So about 70% into production we completely scrapped that idea and started working on the weapon factory. The weapon factory, in a nut shell, allows players to create their own weapons. As players become stronger and obtain more money in the game they can purchase stronger components for the weapon factory. To see a more detailed explanation on the weapon factory and see it in action check out the video above! Check out the latest video displaying a few of the weapon hit effects available in the game! 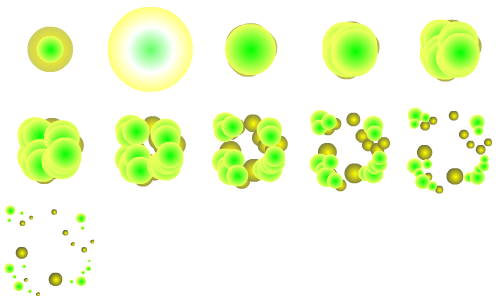 Hit effects are special abilities that you can apply to projectiles when you create a weapon in the weapon factory. Some of the effects include freezing, life leech, explosion, teleport, and many others. Keep checking back to see footage on other hit effects! Just updated the Sparkrift website with a post on the character design evolution of Robofish himself! Robofish is the main character in our upcoming xbox live indie game. I am the graphic designer on the project and have learned a great deal in the process of making this game and hope to share some of that in this blog. Check out the latest video on Robofish! This video displays our survival mode in action. The difficulty is set on the hardest so you will see how a combination of a good weapon plus upgrades can really be useful for staying alive longer. Check out all the Robofish media on the Sparkrift Youtube Channel. Welcome to my personal blog. I am currently developing Xbox Live Indie Games with my brother, Jacob. Visit our website below to check out our latest projects.